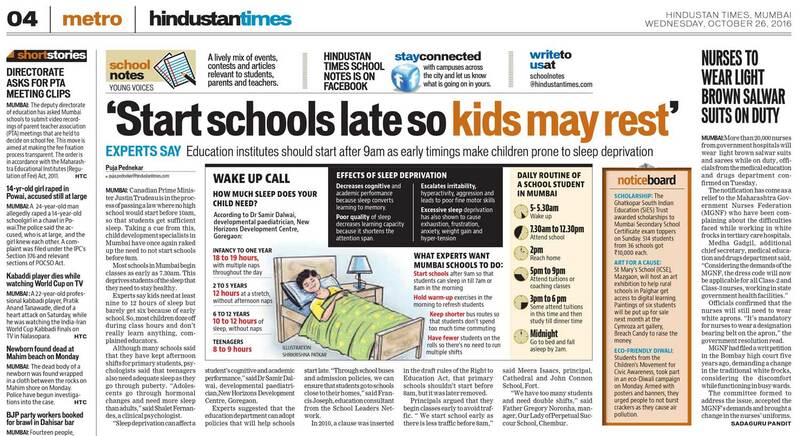 School timings may be beyond the prerogative of all of us, but there is so much that we as parents can still do! 1. Every child should receive 10 – 12 hours of continuous sleep depending on their age. With lack of sufficient sleep hours, child is often found to be drowsy and sleepy during the school hours and misses on quality learning. 1. No TV/media before sleep time. 2. Having fixed meal times, especially an early dinner. 3. Outdoor physical play every evening so that the child burns up energy. 4. Completing studies and school work by 5-6 pm. 5. Afternoon naps need to be avoided so that the child may sleep early and longer at night.